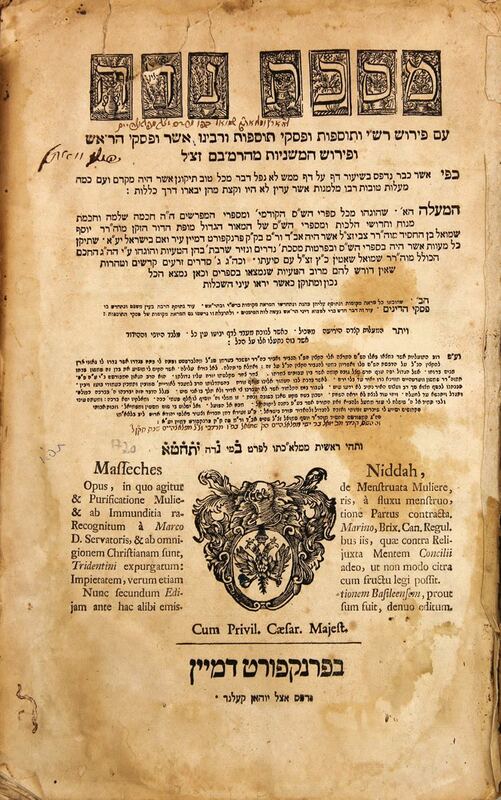 From the Talmud Bavli with commentaries of the Rosh and Rambam. At the end are Mishnayot from Seder Taharot. Separate cover for these. Covers with pretty decorations from woodblock cuttings. Printed by Johann Kellner. Signatures and listings of ownership. | Bound with ancient wood binding, covered in light decorative leather, with remains of clasps. Spine is defective, moth damage. Stains. 88; 178 pages. 35cm. Generally ok to good condition.